Under Medicaid guidelines, a disabled adult or a frail elderly person would need to go into a nursing home to be able to access Medicaid funding to pay for their care. However, each state has a waiver program that allows the person to divert that money into community-based support services that allows the person to remain in the community, if not in their own home. In Wisconsin, there are three programs that offer this type of waiver. One is Family Care, which can provide such things as residential services, day programming and personal cares. Another is Partnership, which does the same thing as Family Care, but includes an HMO component for medical care. The third is IRIS, which allows the person to self-direct their services. At least one of these programs is offered in 57 of the 72 counties in Wisconsin. Many of them have two options, Family Care and IRIS. Of the remaining 15 counties, eight of them are already in the process of transitioning to Family Care. In his 2015-17 proposed budget, Scott Walker wants to make sweeping changes to these programs and the way they are administered. Other changes include dissolving the regional districts and making Family Care contracts available only to companies that can operate state wide, such as Big Insurance companies. Walker would also allow the state to contract with anyone for for the Aging/Disability Resource Centers (ADRCs), which are currently run by the counties. 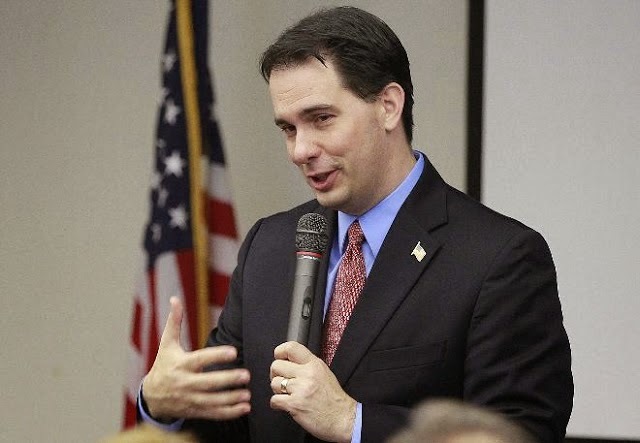 Walker would also abolish ADRC governing boards and long term care councils. Walker would also award all of these contracts in a no bid process. And to show that the care of these vulnerable adults are not his priority, Walker wants to take oversight of these programs from the Department of Health Services and give it to the Commissioner of Insurance. In other words, Walker wants to force the frail elderly and disabled adults into a single, expensive program. He then wants to give these contracts - worth more than $3 billion - in a no bid process to large for profit insurance companies, who will have little or no oversight. Gee, do you think he is fishing for the Big Insurance campaign donations with this immoral giveaway? Ah, but that's not all. With all things Walker, there is more. There is always more. Walker is not satisfied with just going after the disabled adults and frail elderly. He wants to go after disabled children as well. Included in Walker's budget is the elimination of the Family Support Program, which helps families with disabled children to get special equipment or services that are not covered under Medicaid. Just when one might think that Walker has hit the depths of maleficence and greed, he finds a way to prove us wrong. Walker and his apologists will point out that his budget calls for expanding Family Care to all 72 counties so that no disabled person or frail elderly person would go without these "services." Don't be fooled by this claim. Because the currently approved waiver includes and entitlement to waiver services, we are instructing the State to operate the waiver as it was approved by CMS. Therefore, we are directing the State to identify any individuals not currently enrolled onto the Family Care or Self-Directed Supports waivers since the July 1, 2011 implementation of the newly instituted enrollment caps, and immediately enroll those individuals in the waiver programs. This includes individuals living in any counties who had or would have had an entitlement to the waivers as of July 1, 2011, and includes individuals who were or would have otherwise been selected for enrollment from other participating counties. In ancient history, people would put their frail and disabled people out into the cold for the wolves. Walker is doing a modern day version of this where he is throwing these vulnerable citizens to the corporate wolves. "Not his priority" is a great Capper understatement. I am sure that he wants it to be out of sight and out of mind, where whatever hideousness goes on, he can disavow any direct knowledge, or accountability for it, yet still enrich his Corporate Donors. So you're saying that you support these cuts, capper? Hard to believe. Anon 4:52, Again another brilliant deduction by a Walker troll. You support a steaming pile of poop, a disgrace to our state. Your comments need to keep coming so more people learn how flipping stupid his supporters really are. I wonder what AFSCME thinks about all this.. anyone know where I could find out? There is a time coming when advocates will need to decide if they can unite stand up and fight or just step back and allow our communities to take a transformation that will forever change how people needing support will be seen. Walkers hatred for the poor and weak is nothing new. As county exec the state took control away of the countys health and human services and soon after he left the mental health services, from the douche bags willing mismanagement. Also because of The assholes differed maintenance he murdered a teenager at Odonnell park. Here is another reason why Walker needs liberals. Because of liberals, Wisconsin has the wolves needed to effectively implement WalkerCare. As a side benefit for Sportsmen for Walker, the increased food for wolves will mean more of them so Sportsmen for Walker can kill more for them. Win-Win all the way around! So in your fantasy, liberals are vicious animals to be hunted by sportsmen because they eat our children, and they are useful enablers for Walker. Real grindhouse stuff, there, pal, or maybe it's just more wingnut psychosis. Walker knows that Eating Our Children is an important plank in the Tea Party platform. For if the Tea Party does not kill the children, then the children will kill them in their sleep. But first to dispatch the seniors with their gimme-gimme attitude toward Social Security and Medicare. Why can't old people live in poverty and without healthcare like hard-working WalMart workers? This may put on display more than any other damage inflicted thus far—Scott Walker's misanthropy—guided by an evangelical certainty in his righteousness. There is something wrong with this guy. Tell me Scott Walker does not have an Antisocial Personality Disorder. He is showing his love for people like Rauner who made his money treating people like animals in his care homes, that were bankrupted after family members sued for abuse and death of loved ones, yes Republicans voted for him to. It is so ungodly. IRIS is a program that keeps government decision making out of our lives. I am confused on how our party of less government wants to put citizens from a less government intervention program into an program of big government! What happened to our republican roots with Gov Walker? These Tea Party fools think giving a multi million dollar program to private industry, where they have a profit motive to give lousy service, while giving their administrators bloated salaries, and to corporations having no commitment to the communities they serve and no obligation to make their documents open to the public, makes more sense than a government run program ! Exactly! It is just what they are doing to education! Is no one connecting the dots and what's going to be next? Because we all know, raising taxes on the wealthy is never going to be an option for these amoral people. They will be serving soylent green in nursing homes before they'd ever consider such a thing. Both IRIS and Family Care need to be protected from privatization. Some of us wonder if this IRIS scare is to distract us from the privatization of Family Care. He will flip and leave IRIS for some good press but in the mean time Family Care will become an insurance company. In the end IRIS will be dismantled and we will be left with a terrible long term care system for all. Hard to believe that people have the nerve to make this stuff up. Even scarier that people out there believe it. Good program on WPR Kathleen Dunn yesterday about this topic. There is absolutely no legitimate reason for walker to attack these programs. They work, they are sustainable, consumers are happy with the services, etc. Family Care was/is in the process of expanding to more counties!! It''s got to be about privatizing and sending the $ to Big Ins. Companies. That and his power trip. He really does have to be a sociopath-he proves it time and time again.Has he no sense of decency? (scott is the new joe) He thumbs his nose @ many of his constituents but I'm picturing: all those who use these programs- descend on the capital-wheelchairs, walkers, hospital beds, sick and the frail disabled, etc. Get the tv cameras there-the visual would have to move some of these repub legislators but then again, they are in lockstep & enamored with sicko walker & obediently sign whatever he wants. I will be contacting my legislators-but both right wing-:( What else can we do? Anyone?